This past weekend marked the 240th anniversary of “the Shot Heard ‘Round the World”—the opening engagement, in Concord, Massachusetts, of what became the American Revolution. There at the North Bridge, on April 19, 1775, colonial militiamen fired on British soldiers who’d marched from Boston to seize an arsenal of weapons cached in the town. Earlier in the day, the British soldiers had gunned down colonial militamen in the nearby town of Lexington—but this time, when they opened fire on the colonists (killing two of them), the colonists fired back. Two British soldiers died, and a third was mortally wounded. At Concord: Two colonial militiamen and two British soldiers. 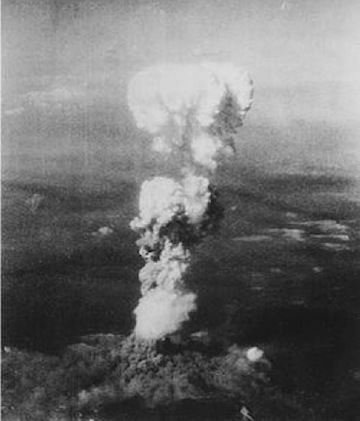 In Hiroshima: 80,000 civilians—and that was just when The Bomb went off. Some estimates put the death toll as high as 140,000 after the long-term effects kicked in. The two events made for a curious—and surprisingly poignant—juxtaposition. One marked the long ascent of America from nascent nationhood; the other demonstrated America’s place as the world superpower. This entry was posted in Revolutionary War and tagged Concord, Hiroshima, Lexongton, Ralph Waldo Emerson, Revolutionary War, World War Two. Bookmark the permalink.